PIZZA TEEN! : BREAKING NEWS! More Americans Are Giving Up Golf! Hooray! BREAKING NEWS! 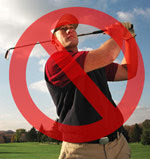 More Americans Are Giving Up Golf! Hooray! "We have to change our mentality." "The problem was not a game of golf. It was the game of golf itself." "A two-year campaign by the foundation to bring new players into the game...'hasn’t shown much in the way of results.'"